Prisoner, when called on for his defence, said, that the mare was young, being but three years old, and that she became unmanageable from the noise of the people; and that he rode over the deceased from accident, being unable to restrain her.__The Learned Judge, in his address to the Jury, said, that owing to Mr. Slaytor’s absence, the cause of the deceased was not proved; if it had been proved, his Lordship said he should have left it to the Jury to say whether the mare had ran away, and the death was in consequence accidental; or whether the prisoner had a sufficient control over her to have prevented what had happened; for, if so, it would have been Manslaughter; as it was, the Prisoner must be acquitted.__The Jury returned a verdict of acquittal accordingly. Fancy fairs, which originated in church festivals, are now returning to their pristine use. At the first attempt at their restoration many designated them “vanity fairs”, but now all sections of the church (excepting, perhaps, the Quakers) have legalised this method of getting money for the purposes of religion and charity. It is a singular sign of the times that after friends have paid their subscriptions to an object, they are willing to spend their money at a fancy fair or bazaar, to make up the deficiency in the funds. And yet it is not to be wondered at. The gay company, the cheerful music, the brilliant scene, and though last, not least, the fair syren-like vendors, easily account for our willingness to be “sold again”. Such a fair or bazaar has just been held at the village of Elmswell, a few miles from Bury, on the Ipswich line, and containing a population under a thousand, and the object was to raise money towards paying for the National School now in course of erection there. The greater part of the village is close to the station, and the church, rectory and schools, are some half-mile distant. This is a good instance of the young and growing vitality now so observable in the Established Church. The Rev.W.H.C. Luke, a young clergyman, has had the living but three years, and yet in that time he has restored the chancel of the old church, built a fine rectory, and now nearly finished the national School.The last named is a red brick building, somewhat of the Gothic style, situate a little way from the church. It is capable of accommodating 80 children, and nearly that number are awaiting admission.The building has been erected by Mr Andrews, of Bury St. Edmunds for £500. There is a school-room and a class-room, which can be thrown into one for lectures and meetings; the former 45ft. 6in. by 17ft., the latter 16ft. by 12ft. The principal window nearest the lane is early English, with three lancets; and there is a little belfry rising from the centre of the roof. The site was generously given by Admiral Sir George Seymout; and .£450 has been either given or promised to the fund, leaving £150 to be raised by the bazaar, exclusive of the fittings of the master’s house; the latter will cost about £200. He gains the least who does the wrong. But you in buying do far better. Judging by the industry of the “official”, we should say the post office was a good savings bank for the school. We then passed on to the large marquee, kindly lent by the Bury Horticultural Society, and at the entrance were met by a clergyman, who, blowing round a circular inscribed cardboard, which he held in his hand, wished to know if we wanted our fortunes told, for a penny. This place was decorated with a green festoon extending from pole to pole, from which were hanging Chinese lanterns, and the poles were surrounded with flowers. The stalls (covered with pink cambric and muslin) were placed along each side, and separated by fancy trophies. The stock-in-trade was of the usual description — wool-work, bead-work, needle-work, crochet, babies’ wardrobes, photographic views of the church (by Mr Spanton of Bury), dressed dolls, pin cushions, toys, articles for the toilet, fruit, flowers, &c. The proprietor, the worthy rector, exerted himself in doing business with all the bonhommie of the Vicar of Wakefield, and was ably seconded by his fair assistants — Lady Mary Phippe, Mrs Luke, Mrs Crawford, Mrs Edward Alderson, Mrs Connell, MrsW Luke, Miss Rawcon, Miss Lancaster, the Misses Rodwell, and the Misses Alderson. If any one with money in his pocket could run such a gauntlet without investing, he must indeed be a hardened reprobate. Passing out at the other end we reached the refreshment booth, where a light refection might be had at a moderate charge. Here, as well as by aunt sally, and a weighing machine, many a penny was turned with a small air cannon, which shot arrows upon a target. The band of the East Suffolk Militia Artillery from Ipswich, under the conductorship of Mr H Carter, attended on the first day, when the weather was very unfavourable till the afternoon. Then the visitors from the neighbourhood poured in thick and fast, and among them we observed theVen. Lord Arthur Hervey and family; Major Parker, M.P., and family; Hon. and Rev. Mr Phippe, Capt. Blakely, Capt. Katterwell, Rev. Mr Terry (Tostock), Rev. H.S. Marriott, (Woolpit), Dr Dicken (Norton), Mr Beale, Mr Crawford, Mr C Rawson &c. £110 were taken. The next day, the weather being fine, and the admission free, a good number of the poorer parishioners attended, those purchases, however, did not tell much in the total. The sum of £502 5s. 7d. mentioned in a previous Issue was for the Village Group only, and did not include amounts collected by local firms, who have their own group. THE local branch of the British Legion held another dance at the Old School on Saturday evening, when there was a fair attendance. Members of the branch assisted with the arrangements, and Jack Day’s Dance Band was in attendance.At the Old School on Tuesday evening another dance attracted a crowded attendance. An R.A.M.C. Band supplied the music. There was another on Wednesday evening. Sixty-five scholars of the Parish Church (including several evacuees attending the school), had their annual treat at the Old School on Saturday afternoon. Following tea, the children were entertained to games, etc., for which small prizes were given. In the evening the Hon. Mrs. Morgan Grenville presented record books for attendance and cheers were given all helpers. The absent scholars were not forgotten and had their usual gifts. Elmswell has now raised £100 for the Bury St. Edmund’s and District Spitfire Fund. The net total was made up of house-to-house collections, £59 18s. 8d. ; Christmas draw, £17 2s. ; special efforts, £13 6s. 2d. ; sale of acorns, £2 17s. ; extra donations, £2 l3s. 6d. ; sale of jam jars and bottles, £2 9s. 8d. ; sale of linen, £l 9s. ; sale of garden produce 4s. of Castle Camps, Cambs., who passed away suddenly aged 74 years, took place on Tuesday last, The Rev. A. Hore, of All Saints’ Church, conducted the service in the church and at the graveside. Deceased leaves a widow five sons and five daughters. The immediate mourners were: Mrs. E. Hannah (Ethel), Mrs. G. Austin (Gladys), Mr. R. A. Edwards, Mrs. L. Barnett (Letty), Mr. A. S. Edwards, Mrs. W. Gray (Winnie); Mr. J. Edwards, Mrs. D. Harris (Dorothy), and Mr. F. Edwards. Many beautiful floral tributes were sent, including one from the Castle Camps Parish Council, of which the late Mr. A. E. Edwards was a member. He was born at Elmswell, and lived there for about 40 years. He took an active part in the social and public welfare of the village and was treasurer of the Ancient Order of Oddfellows for a number of years. whose death occurred last week at the age of 72 years, took place at the Baptist Church on Saturday afternoon, with the interment at the cemetery, the Rev. A. Tilling (Baptist Minister), officiating. Mrs. Tilling was at the organ and played suitable music, while “Jesu Lover of my Soul” and “Rock of Ages” were sung. The mourners were: Mrs. F. Rice daughter; Mr. P. Manning (Elmswell), Mr., R. Manning (Wetherden), sons; Mr. F. Rice son-in-law; Mrs W. Dorling (Haughley), Mrs. J Sparrow (Wetherden), sisters; Mr. Algie Rice, Mr. Gerald Rice, grandsons; Miss Rosalie Rice, granddaughter; Mrs. P. Manning, and Mrs. R. Manning, daughters-in-law; Mr. J. Sparrow (Wetherden), and Mr. J. Dorling (Haughley), brothers-in-law; Mr. Jack Sparrow, nephew; Mrs. Aldis, niece; and Miss N. Friend (Chevington). Three brothers and three sisters were unable to attend. Others present were: Mr. Walter Manning, Mrs. Nunn, Mrs C. Armstrong, Mr. R. Baker, Mr. and Mrs. H. Pearson, Miss Pearson, Mrs. and Miss Woolnough, Mrs. and Miss Borley, Mrs. W. Goymer, Mrs. A. Nunn, Mrs. G. Clarke, Mrs. Faires, Mrs. A. Miller, Mrs. Gregory, Mrs. Goddard, Mrs. Steggles, Mr. R. Leach, Mrs. D. King, Mrs. W. Howe, Miss E. Pegg (all of Elmswell, Mrs. Salmon (Norton), Mr. Worby (Great Ashfield). There were several floral tributes, which were inscribed: In ever-loving memory of dear mother and grannie, from Rosie, Fred and Algie, Gerald and Rosalie. To dear mother, from Percy and Lily. In loving memory of dear mother, from Bob and Maud, From brothers and sisters at Herringswell and Newmarket; Annie and Jim; Will and Flo and family, and also Will, Ruth and Vera (Barrow); Walter and family; Mr. and Mrs. Woolnough, Teddy and Betty; Norah; the members and friends of the Elmswell Baptist Church; Mr. and Mrs. D. King; Mr. and Mrs. W. Howe. The funeral arrangements were carried out by Messrs. Mulley Bros. (H. E. Mulley), Cooks Road, Elmswell. The Ministry of Food announced on Tuesday that it will not be possible to give any special allocation of sugar to individuals for jam. The co-operative preserving scheme in operation last year is to be extended to cover as much as possible of the fruit from gardens, allotments and private orchards. The scheme will be open to everyone. In the rural areas preservation will be done in school halls, domestic science kitchens or suitable private kitchens under the supervision of trained leaders. Fruit will be brought to the kitchens, purchased from the grower, and pooled for preservation. Sugar will be purchased with permits supplied by Food Executive Officers. The scheme is not intended to operate in Northern Ireland. Separate arrangements for Scodand are in course of preparation. Referring to last year’s allocation of sugar, Lord Woolton said that there was no evidence that the jam produced bore any proportion to the amount of sugar that was applied for. He created more discontent among the people who did not get the amount of sugar they thought they ought to have than contentment among the people who got perhaps rather more than they ought. “For the soft fruit that will be made into jam we shall make no domestic sugar ration,” he said. “There is the later and larger problem of jam-making from stone fruit. We will wait until the Battle of the Atlantic is finished before we make prophecies about what will happen in the Autumn.” The jam to be made by the women’s organisations would be for public and not private use. At a public meeting on Monday it was unanimously agreed to start a jam centre in Elmswell. Mrs. Black (Beyton) explained the scheme. Mrs. Kirkwood, who presided offered the use of her kitchen, and nine preserving pans and nine oil stoves were also offered for use. The General Committee was formed, Mrs. Goode, Mrs. Oxborrow, Mrs. C. Hawes, Mrs. Roden, Miss Head, Mrs. Morrison, Mrs. Kirkwood, Mrs. Crosse, Mrs. Welham, Mrs. Simmion, secretary, and Mrs. Kirkwood was elected chairman, Mrs Simmion secretary, and Mrs. Welham treasurer. Mrs. Roden will act as supervisor, and Mrs. Kirkwood, Mrs. Crosse, Mrs. Salmon, Mrs. Roden, Miss C. Baker, and Miss Green will be chief helpers, while fourteen others also volunteered to assist. Miss Green is undertaking the collection of jam jars. We are grateful to the East Anglian Daily Times for permission to reproduce the following three articles. THE TINY village of Elmswell, which lies about a mile off the A45 Ipswich to Bury St Edmunds road, has had a printing works in its midst for four generations, but not many people knew this outside the immediate area — until now. But a complicated piece of machinery costing £125,000 is about to change this image and put printers, W. W. Hawes. well and truly on the map, particularly in the European exports field. 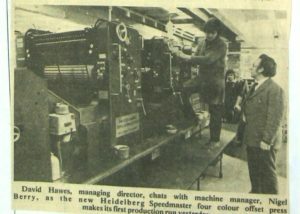 Managing director, Mr David Hawes, who still lives in the 19th Century family house next door to the works, says the machine, a Heidelberg Speedmaster four-colour offset press, is the company’s biggest single investment to date and will, he hopes, put them on a much higher bargaining basis for some of the lucrative printing orders in Europe. 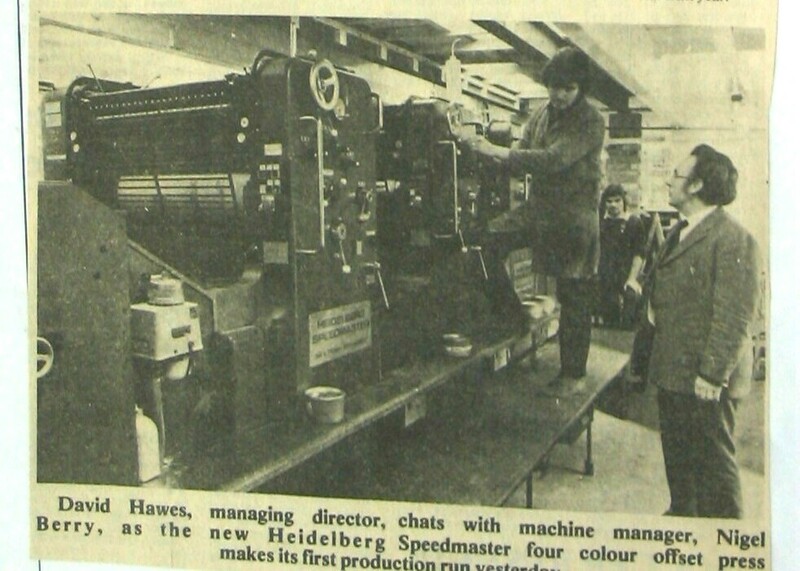 The machine, in simple terms, can print leaflets, brochures ond other products in four colours simultaneously and it is, according to Mr, Hawes, the first of its kind in East Anglia. “This machine enables us to produce much more precise work than in the past, and the quality is virtually guaranteed,” he said. “One big advantage is that you can see the finished result almost immediately.” He adds that the new machine is also more economical and can produce the finished product in half the time. The company currently employs a staff of 35 and Mr Hawes is hopeful that, with increased business, he will be able to take on more staff in the next year. TWO Mid Suffolk District Council warden-supervised housing schemes for the elderly have been opened. Council chairman Mr Rex Willsher unveiled plaques at Hurstlea Court, Needham Market, and Mann’s Court, Elmswell. 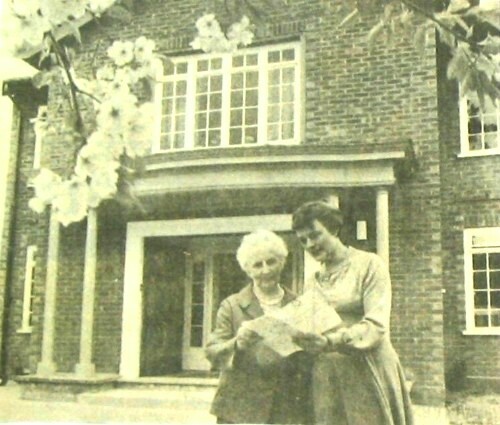 No more similar schemes are being undertaken meanwhile but Mr. Willsher said he hoped more would be provided in the future.Housing committee chairman Mr. John Swain said that Hurstlea Court and Mann’s Court brought the total number of warden-supervised units for the elderly in Mid Suffolk to about 300. Hurstlea Court, costing £199,675, consists of 20 one-bedroom flats, a warden’s flat and communal facilities. There are seven one-bedroom bungalows, two one-bedroom flats, a warden’s flat and communal facilities at Mann’s Court, which cost £120,337. 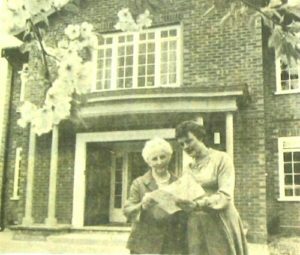 Warden Mrs. Jo Rogers and oldest resident Mrs. Louisa Redit (87) at the new Mid Suffolk District Council wardened accommodation at Mann’s Court, Elmswell. AN ELMSWELL farmer has made a series of unusual discoveries while renovating an historic farmhouse. Mr. Dennis Dyball, of Willow Farm, was digging through old foundations, some of which date from the 11th Century, at Oak Farm House on the Ashfield Road. He came across a horse’s head fixed into the foundations. Further discoveries included pieces of porcelain, and sandals which are thought to date from the 16th Century. The sandals are beautifully preserved. One lady’s shoe is intact and has leather strappings and a wooden sole. The shoe also has a metal platform under the sole to raise the wearer’s foot above the mud. Mr. Dyball says, “It has made the job of renovating the house very interesting. We keep coming across unusual objects as we make progress with the building.” He is keen to preserve the original appearance of the house and has exposed some beautiful curved beams. It appears that parts of the 11th Century building were left intact when it was modernised hundreds of years ago. Other discoveries include clay pipes and a lead spoon. They had been embossed with the same motif. Mr. Dyball also discovered sections of a stone quern used by the medieval family for grinding corn. Mr. Dyball said small amounts of wheat were also found in the house, and they appear to be of an unusual variety. “The horse’s head is something of a mystery. Archeologists have told us that it was not uncommon for animals such as cats to be buried in old houses, but they could not explain the presence of the horse’s head,” said Mr. Dyball. The owner may have been fond of a particular horse and decided to bury it within the house when it died. The house has also given up another interesting secret about its past. A more recent occupier appears to have had a particular fondness for good quality Ceylon Tea. Several lead tea packets were found stuffed into the walls. They bear the name of the firm, Walker and Dalrymple, and the words: “Intermediate pure Ceylon tea”. ANXIOUS villagers are to approach a developer to see if parts of their Victorian primary school can be saved before the bulldozers move in. On Monday, Mid Suffolk District Council western area planners gave permission for a 26-home development on the site of the former school in Elmswell. The scheme was fiercely opposed by parish councillors, who have now decided to write to applicants Felbriggs to see if parts of the school can be retained for use in the proposed new community centre in Ashfield Road. The homes include a mixture of one and two bedroomed flats and maisonettes, single bedroomed houses and bungalows. The planners only gave permission for the scheme provided their chief planning officer Bernard Horstead could negotiate improvements to the boundary of the School Road site to protect neighbours from proposed car parking areas.